I know… I should know better by now, especially since I’ve written about the exhorbitant prices that hotels charge for room service. 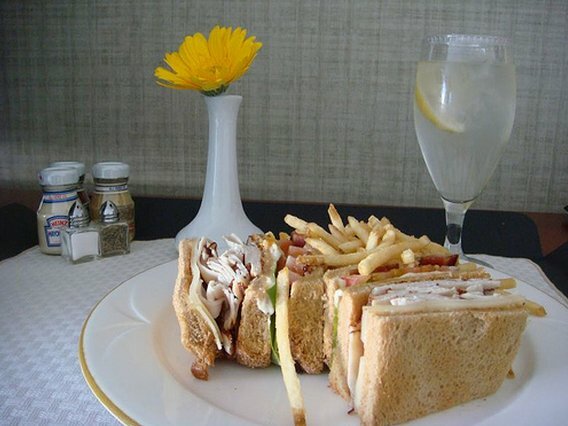 And the Turkey Clubhouse sandwich on the Westin Casaurina’s room service menu sounded just perfect to munch on, while I worked on my talk for PPC Classroom Live last Saturday (December 1st, 2007). Although I did see the $14.00 price and had noticed that *a 2.50 delivery charge, 20% gratuities and applicable state taxes would be added to the bill, I suppose perhaps I should have ADDED those figures together before I ordered this little treat. AND to make matter worse, despite the fact that I’d paid a delivery charge, I added a tip to the bill. They know how to make you feel guilty! Now, I wish I could say that it was a tasty little treat – but alas – the bread was smothered with so much mayo, that I after 3 small bites, I ended up removing the bread and eating just the turkey, lettuce and tomato filler. Hmm… I could have bought a LOT of turkey for 23 bucks! I am not surprised about this little story. Although I did not order a sandwich and because of that did not have the pleasure of trying the Westin Las Vegas “Mayo Sandwich”. I had an opportunity to experience the legendary Westin customer service. You see I was expecting a parcel to be delivered to me to take home to New Zealand. Well, at 6.20am on Monday morning I received a call from Reception that the parcel had arrived, should they bring it up to my room? As I had only been in bed for about 2 hours when the phone rang, I declined the offer and advised the caller that I would pick it up from Reception after breakfast. Knowing that what I had waited for had finally arrived, I slept really well for another 2 hours before heading to the restaurant fr breakfast. Then I stopped by the Front Desk to pick up my parcel. Guess what: No one knew anything about it. Not about the delivered parcel, nor about a call that had been placed to my room. I must have been dreaming. Hmmm, I insisted that I had been awake and that it could not have been a dream. Anyway, the parcel was never found. Not until after I had checked out, made my way to las Vegas airport, through security, to San Franzisco, to Auckland (NZ) and then to Nelson (NZ). Once I had arrived home, I thought I’d check again to see if a miracle had happened. And…..sure enough, the parcel had been there all the time, ok, it was at the Bell Desk, not at the Front Desk, but what the heck. Had I enquired at the Bell Desk, they would have found it, that is what I was told, truly. I know that big corporates are usually very methodical about their procedures, so it was hard to believe that they did not have a procedure in place that would allow an activity like that (the receipt of a delivery for a guest) to be recorded in their system. That way anyone of the staff could have helped me. I now come back to your experience Rosalind and the prices the Westin las vegas charge for their services. Believe it or not, they actually had the nerve to ask me pay for the forwarding of my parcel to my home address. What do you think I told them?